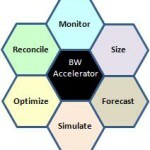 One stop tool to administer BW Accelerator & to reduce TCO. BW Accelerator is an expensive commodity. BWA Workbench minimizes TCO by optimizing blade utilization. Under-sizing BWA results in costly resizing tasks, while over-sizing wastes resources. Right sizing minimizes overall cost. BWA Workbench provides sizing capabilities that are not available in conventional methods. Maintenance costs are drastically reduced by automating data reconciliation and rollup monitoring tasks.